I have this tendency to buy a lot of ingredients on a whim without much thought as to what I will use it for and whether I’d even have time. This is a very bad habit as I constantly see perfectly good produce looking sad and not fresh then having to make things in a hurry. Before my cousins arrived in Australia a few weeks ago, Yuye and I went shopping. I saw cream and thought ‘hey I need some of this!’ It’s all okay and good but then I went ahead and bought 2 600ml bottles, forgetting that there was already one at home. I ended up using just 1 of them in this green tea and strawberry parfait recipe before I embarked on my around Australia trip which lasted 2 whole weeks. Thankfully my cream was still within use by date when I got back but just barely. What can I do with so much cream? One of them was to make ice cream but I was out of milk at the time and would have taken too long to churn since it was getting quite dark outside. 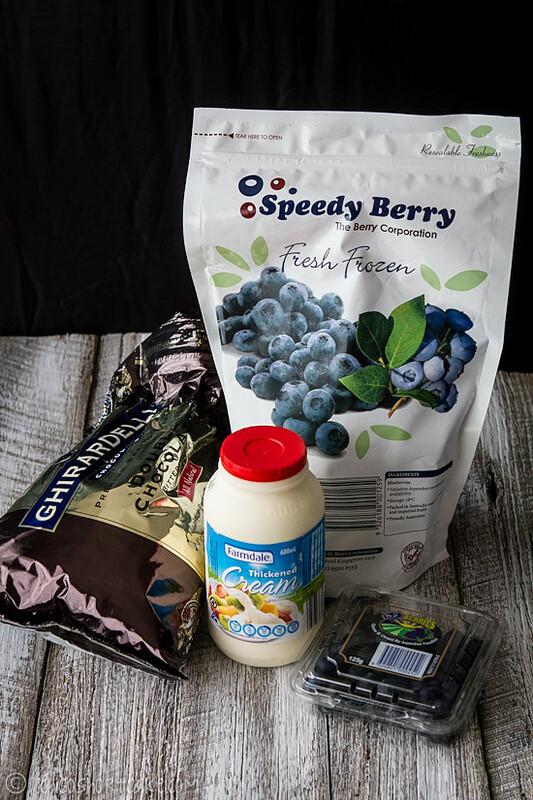 I quickly dug out all the other ingredients about to go off and found half a punnet of blueberries. 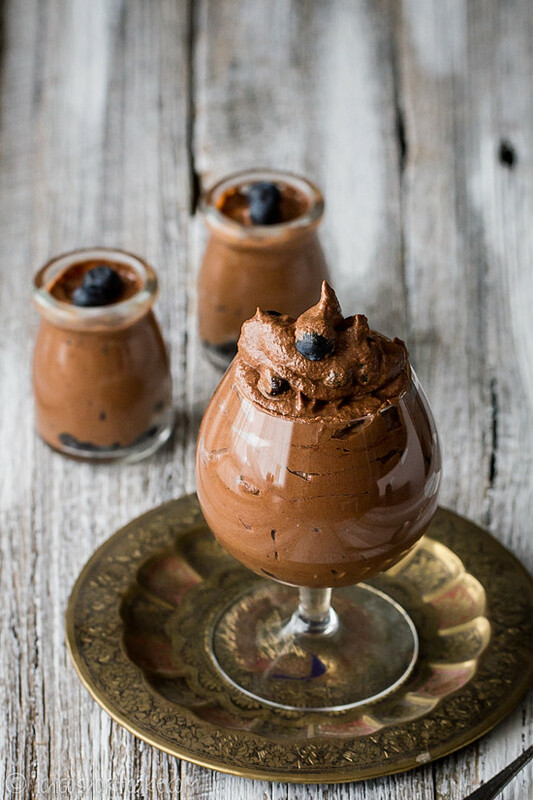 So my recipe became the super fast and easy blueberry and chocolate mousse. This recipe literally took about 15 minutes to make (took me 3 times as long to photograph though). 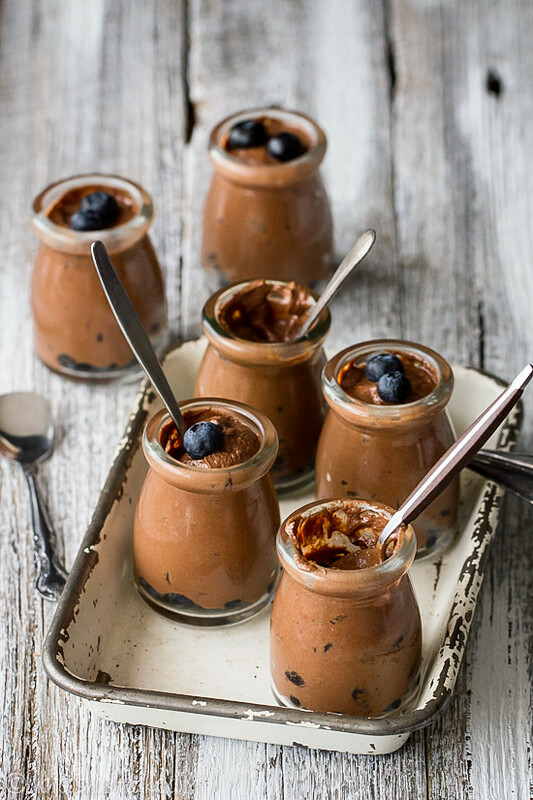 It’s by no means the best chocolate mousse recipe as it’s a very minimalist and easy one to make. It just seemed like a good idea for the limited time I had. So if you ever found yourself in the same situation and is pressed for time, give this recipe a go. It’s great as a party dessert but since it has hardly any ingredients, it doesn’t keep as well. After refrigeration, I found the mousse became a bit denser than other recipes but since it was great when made fresh, try to consume this within a couple of hours. The recipe made slightly more than I expected as the serving glasses I used were very small. Feel free to cut down the ingredients if you don’t want to make as much or use larger serving glasses. I had a huge glass of mousse left over after filling them, not sure if Yuye wants to eat so much mousse! 1. Melt butter and chocolate over a double boiler (watching that the bowl does not touch the water), stirring occasionally under all melted and smooth. 2. Whip cream in a medium bowl until soft peaks form and then fold into the melted chocolate. 3. Roughly smash the thawed blueberries and mix them in with the chocolate mousse. 4. Line the bottom of 6-8 serving glasses with fresh blueberries, leaving a few per glass as garnish. 5. 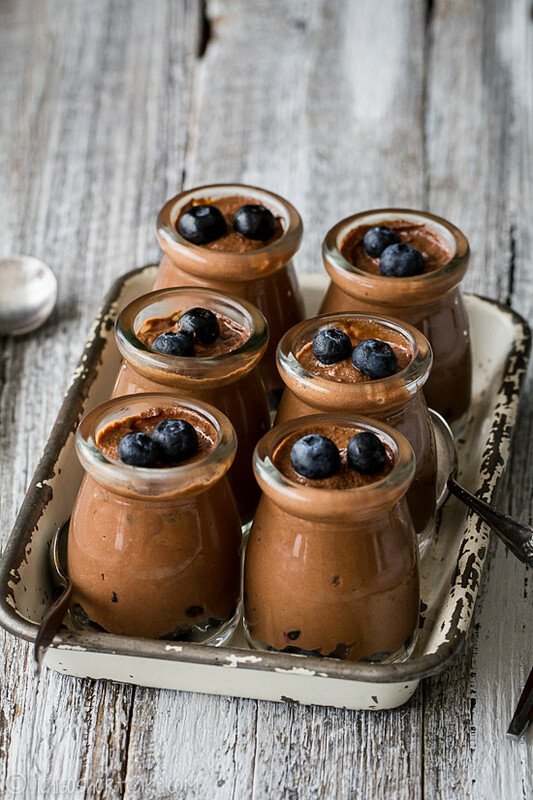 Fill glasses to the top with chocolate mousse and garnish with fresh blueberries. 6. Refrigerate until ready to be consumed. Question time Do you like to shop for groceries in one go so you won’t have to keep going out for things or do you like to shop whenever you need something? Looks amazing! I would love to try some. I am always buying things because “I might need to make something…” I have so many blocks of chocolate at home and so many types of packet nuts!!! LOL! so I don’t think any cooks are different. Mmm that chocolate mousse looks so good. I tend to get carried away with groceries, especially with the 2 for $6 dips at coles. Such good value, but not enough people in my house eat dips. Pics are gorgeous! And with dark chocolate and blueberries, this dessert is practically health food! Looks delicious! Your pictures are great too. Okay, this is seriously the most gorgeous mousse I have ever set eyes on! Wow. These little guys look incredible! So pretty and delicious! such beautiful photography! I am in awe, and seriously craving this! Your photographs are stunning and I’m sure that this mousse taste just as good as it looks! This mousse looks delicious!! Congratulations, your photographs are beautiful. These are some of the best photo’s I have ever seen. What is the camera you are using? You are truly an artist. I am going to try this mousse next time I have a dinner party. Love your site.. and love these little desserts! Would love to know where you got your jars from though…? Where did you get these cute jars the mouse are in? I’d love to get some. Thanks! Please read the previous comment, I mentioned already where I got mine from . Thanks!